That is a wonderful story, inspiring! Thank you for sharing. It gives hope to us who are still struggling…. I am wondering what test or tests you had done to show that the lump is no longer cancerous? Stage 2 in 2011 thought I was cured, stage 4in 2016 breast now in bones. 8cc tumor. Dr. FORSYTHE is my doc. IPT CHEMO, IVC MANY SUPPLEMENTS. I’M 77 in good shape, taking DE &14 other supplements. Interested in all info. Also doing hyperthemia USING bio mats. My sincere congratulations to you on this victory! You are a great warrior! You are an answer to my prayers! I have been diagnosed with stage 4 Inflammory breast cancer because its in my llymph nodes. However, because it’s inflammatory breast cancer, it’s more fatal, but the cancetr is only in my breast! I have a husband who are very knowledgeable and are very proactive. He watched and bought the book The Truth about Cancer. However, he also can be very ” helpful ” wanting me to do everything! I have a practitioner, but he has never treated a cancer patient with this being their only and first choice. He usually treats after the medical treatment has been done first. So I am so excited to have found you! I’m also a Christian and believe in the Power of prayers and laying of hands for healing. Just saw your interview with Chris Wark on youtube – amazing story – well done! Praise God!!!! I am thrilled for you! I can’t imagine the courage it took to say no to the doctors and go ALL NAUTRAL! YOU DID IT!!! Congratulations! I just watched your interview with Chris Wark and enjoyed it. Congratulations on your successful report. 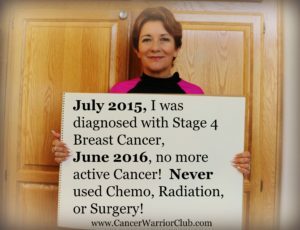 I have been cancer free for almost 10 yrs. now, and I am into prevention big time. I had colon and uterine cancer. I saw your interview on chrisbeatcancer.com and I loved it! It is SO WONDERFUL that you are spreading the word. My father was diagnosed with Hodgkins Lymphoma August 2015. He did chemo, but also several natural things as well and is in remission. It was not long after his diagnosis that I found chrisbeatcancer.com and TTAC and realized that we have the power to heal ourselves. I cannot put into words how grateful I am for people like you that have beat cancer and tell everyone that they did it without all the chemicals and drugs we in the U.S. are bombarded with. I have already shared your story on FB. 🙂 So thankful for you, Chris, and TTAC!!! I applaud you and all your hard work! God Bless You Carla! 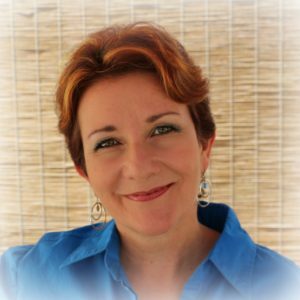 So grateful for your success and your sharing of your story, information and resources. You are an inspiration! Proof a devastating diagnosis can be a blessing in disguise by the strength you’ve been given and the many lives you will touch and save. Gives us all who have loved ones or that are fighting this disease Hope. Thank you with Love! Just saw your interview with Chris Beat Cancer. Thanks for sharing your success story! Congratulations! Lets give our Father God Thanks for saving you so you can help enlighten and help save many more lives.. Actually, I have been using my holistic anti-cancer protocol of eating & juicing green vegetables / fruits & supplements to fight lymphoma that came up under my right arm in Jan 2016.. After losing 25lbs, I have regained 7lbs and alot of my strength has come back.. I think I have turned the corner but will know in 2 months when I go to get scans.. I’m trusting to relate a wonderful success story like yours. I rejoice with you. You made the wisest choice in life by not doing those 3 conventional treatments. I learnt that the most important thing in our healing process is to educate ourselves. The establishment out there is not really interested in our well being otherwise they would check it out how you got well after telling you there’s nothing else you can do. I use IV vitamin C infusions, you have to get that at a clinic. I also buy Dr. Rath, LysinC I will add a link for it. I am so pleased for you Carla. It is great you are sharing your story. I wonder if you might be able to help me with a question. I was diagnosed in August 2015 with secondary breast cancer, with metastases in lymph nodes, spine and pelvis. I have taken a similar route to yourself and have seen significant improvement. The Oncologist is urging me to take Bisphosphonates to strengthen my bones, as she says that cancer always weakens bone. I don’t like the sound of these drugs and am trying to use lifestyle changes to strengthen my bones naturally. I just wondered, as you had cancer in your sternum, were you ever faced with this decision? Did you find it hard to battle against conventional opinion? I find it a struggle sometimes to keep going. I was diagnosed with the same in April 2014… I have been doing a lot of natural therapies along with anti-estrogen medication and recently became a drug was added. This month I told my oncologist I wanted off the drugs because my pet scans were always the same and holding steady which was good but it wasn’t letting me get better. So I told her i was not taking the drugs anymore. She agreed and I will be tested in six weeks to see my progress. I am very excited about this to finally get beyond the medication. It has been a journey as back 2014, I was pulled out of a very dark place medically and I’m doing so much better now. I am Grateful for what she was able to do for me. But now after learning all that I learned from the truth about cancer videos from last fall, I know that this fight is a natural one. Thank you for confirming that I know I am doing the right thing. Thank you for your inspiration. I am so proud of you Carla. Your dedication and drive and strength are inspirational. I hope that if I need to travel this road someday that I can do it with the courage you have shown. Your interview with Chris was amazing nd you are my “go to” resource. Thank you, thank you for doing this for all of us who need you! Much love! Wonderful and inspiring interview, thank you Carla. I am currently under conventional medical treatment for a breast tumor recurrence and was very skeptical to go this route yet again (this is the 4th type of breast cancer I’ve had over the past 15 years since I was 24). Eventually I subcummed to the medical doctors insistence and had the surgery a few months ago and now chemo, however the recommendation is for radiation post chemo and I don’t want to still go through that. I don’t know who to ask, so am turning to this supportive platform to see if I can refuse radiation and rather do the alternative treatments such as vitamin C infusions etc. Of course you have to make your own choices, but as an Adult, you can always refuse treatment. Many Doctors will advise against it, and will probably think you are making a bad choice, but it’s your decision. I think it’s really hard to leave the comfort of your Doctor’s care, and trusting that they know what’s best. We’re not sure about ourselves, and we want someone to be sure. My Dear Mom, who passed away last year, from a long battle with Breast Cancer, did it all the conventional way, except for the chemo I think, but I do know She was taking anti estrogen pills so that her estrogen receptive cancer, couldn’t accept the estrogen, and She had lots of radiation. In my Mom’s case, the radiation damaged her. They had to radiate her by putting something down her throat. She got to where She couldn’t hardly swallow, and so couldn’t enjoy food that much, and She lost most of her hearing. Her throat was burned from radiation and I don’t know how it affected her hearing, but it did. My Mom had such a will to live, and She was a fighter, we just didn’t have all the tools and knowledge, when we could have used them, or at least had the opportunities to do so, if that was our choice. Some People may just go the conventional route, and that’s their choice also. I just think People should have choices. I hope my post will help someone. She was always impressed by Dr. Jimenez s knowledge and compassion, and would tell him, prophetically as it turns out, that if she were ever diagnosed, she would call him immediately. ” Dramatic metabolic and anatomic response to treatment at numerous diffusely scattered osseous lesions, with complete normalization of disease noted. It was your story that gave me courage to go this route. I knew alot of people who did natural therapies for other cancers but I found your story right on time for me, similar cancer, even the same side! I thank you! I will continue on until they see it all clear! I DID FIND A DOCTOR THAT DID THE IVs AS YOU DID! Didn’t want to forget that! I did the IVs (Vitamin C and Ozone) twice a week too! It’s recommended like 3 times a week but money limited me! But I will continue with all the new lifestyle changes! I loved seeing some of your videos on YouTube, and watching your chat with Chris of Chris Beat Cancer. Your story is one that inspires others, to consider that there is hope after a Cancer diagnosis. Umm, I noticed that you said you had infusion therapies, and I know those are expensive. Many of us will be just wondering how we can afford all the stuff we will need to do at home. Naturopathic Doctors, who do these treatments are not cheap, and if one has insurance, insurance doesn’t cover these treatments, and there are People who do not even have insurance. In your opinion, completely do their own natural treatments at home, while following accepted protocols, like the Budwig Protocol, and the Gerson Protocol, and also supplementing at home? What exactly did you do at home? Carla, thank you for this site. On November 2016, I was also diagnosed with stage 4 breast cancer with metastasis to my bones. I wondered if there was anyone out there with mets to the sternum, until I heard your story. I know now that it’s able to be done. Thank you for your story. I am taking femara, but overdosing with high nutrition and other supplements. I will keep you posted. The Dr said that I wouldn’t be able to get rid of it , but my faith tells me I will , as I am following you & Chris beat cancer as well.